What’s an assay and why should you dig for it on a CBD website? And what about a certificate of analysis (COA) - isn’t that the same as an assay? An assay and a COA are not the same thing. An assay will give a complete chemical breakdown - everything in a substance. A COA will give the results of a specific question only. In the case of CBD, a certificate of analysis will typically only show that it meets federal law and has less than .03% THC in the particular batch tested. On the other hand, an assay will show the THC level (all forms), plus all the supporting chemicals (flavonoids, terpenes, all the cannabinoids). A good assay panel will also list all the pesticides and residue contaminants (such as heavy metals), which is excellent information to make sure the produce was grown organically. Good assays and COAs will have the name, address, and contact information for the lab. It will also have the date the testing was performed. Why isn’t it enough just to have a COA? The CBD industry is unregulated. Anyone can make a flashy website and claim they sell only organically grown CBD. A COA only answers one question, usually how much THC is in a given sample. An independent lab analysis, an assay, is how an honest company can be transparent with its customers. Yes, they can have a fake COA or assay. You can always take the next step and call the lab or investigate the lab if you want to. For example, Ravenswood Natural Health currently carries three brands of CBD: Charlotte’s Web, Fountain of Health, and Upstate Elevator. On all three websites, they link to the current batch assays that show chemical makeup, any contaminants, and any THC. The shop also has two other companies that produce topical CBD salves and butters. One uses an isolate, which is super-purified, and the other grows its own and processes it through a local medical marijuana dispensary. An assay is available on request. Charlotte’s Web even has QR codes on each box to link straight to the assay for that bottle’s batch. That is super clear, super transparent. Now compare that level of openness with Brand Z that a friend recently asked me to investigate. Flashy website, lots of science-y jargon. Assays nowhere to be found. Not a whisker of a COA to be seen. I checked out the documents my friend emailed me. Still no assay or COA. I finally found a sort of assay summary - dated December, 2017 (!). No lab information anywhere. The footer read: “Online publication of this document, including social media, is strictly prohibited. Reproduction, except in full, without written approval by Brand Z is strictly prohibited.” According to their address, they have a suite in an office building with a bunch of dentists and insurance agents. They are also next door to Fuzzy’s Tacos. Well, this leads me right back to my one-track rant: Where exactly is the product grown, processed, and packaged? In the back room at Fuzzy’s? I sure as heck don’t see enough room to squeeze a full-bore processing gig between dentist offices otherwise. I hope this blog has helped. Be sure to drop by and check us out. We have more than just CBD and a wild-haired herbalist. Usually, colds come on slowly, influenza tends to hit like a ton of bricks. Fever, muscle aches, cough, chills... you know the drill. Flattened and feeling like crud. What to do about the flu? Some folks will get a prescription to shorten the duration and severity. A. Calling your doc in the middle of flu season may or may not get a speedy response. And the scrip works best at first symptoms. B. Cost: It can cost upwards of $200 - before a deductible! Yeowch! C. Availability: Prescriptions may not be good sitting on your shelf for a few months. Great news for you: There is a solution that won't empty your pockets and is clinically proven to work as well as the prescription stuff! In Europe, there is a hot drink blend (or a regular syrup) of elderberry and echinacea. Several clinical trials have shown that it is equivalent to the prescription without the side effects some experience on the prescription (vomiting, diarrhea, neuropsychiatric). More great news: Pre-made or DIY, We have you covered! ​A. Brand new from NH-based Megafood! 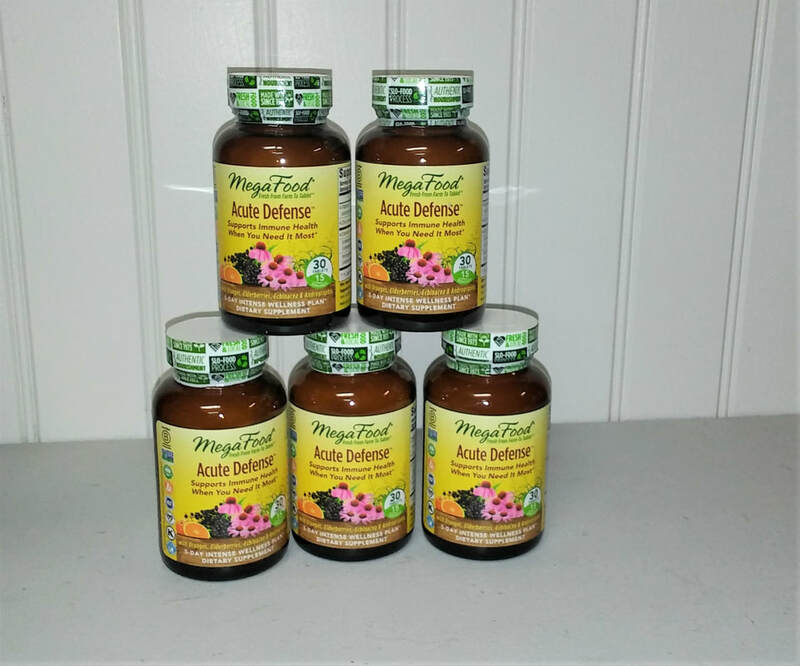 Acute Defense has elderberry and echinacea, as well as vitamin C and zinc. Best part: it is under $20 for one bout of flu. 1. Combine berries, spices, and water and bring to gentle boil. 2. Reduce heat and keep uncovered. 3. Simmer until liquid is reduced by about half., about 30 minutes. 4. Remove from heat, strain, and add honey. Bottle and store in fridge. Adults: 1tsp – 1 tbs daily. Children: 1tsp daily. Last, both the DIY elderberry syrup-echinacea combination as well as the Megafood Acute Defense is excellent for many viral nasties - flu or cold. Elderberry syrup by itself is an excellent daily immune support, safe for almost everyone. ​CBD Part 1: CB -What? “What is this CBD, why is it so popular, and how do I sift the hype and hooie from reality? Will it get me high?” Let’s start with the source: cannabis. – Marijuana is a close cousin of hemp – they aren’t the same plant. Marijuana naturally has high levels of THC (tetrahydrocannabinol) and lower levels of CBD; hemp has naturally low levels of THC and higher levels of CBD. When the THC levels are below .3%, it is considered industrial hemp by Federal law and is allowed for sale almost anywhere. CBD (cannabidiol) is another chemical found that seems to have excellent uses in supporting anxiety, pain, sleeplessness, etc. Marijuana is a bushier, lower growing, while hemp is tall and has sturdy stalks. Full spectrum: squashed in water and extracted, often with a certain amount of heat and pressure. Produces a thick, green, oily liquid. Benefits: you get CBD, plus all of the supporting chemicals in the plant (all the terpenes, the other 100+ cannabinols, etc.). Supercitical extract: Plant, pressure, carbon dioxide. Some feel that this method produces a more complete chemical profile. It all depends on the actual methodology and the plants involved. Solvent extraction: Most times, this will be an alcohol extraction. The alcohol vaporizes and leaves behind the CBD extract. Some folks don’t like the idea of even trace amounts of solvent. Herbalists have been using alcohol for millennia to extract plant material into medical formulas, so it isn’t all that evil. Be careful as some solvent extracts might use hexane – yuck! Full spectrum vs. isolate? What the what? Full spectrum, as I described above, is the squashed-up plant extract. The isolate is just that: CBD completely extracted out of all the other chemicals. Generally, full spectrum provides better and longer lasting relief. The isolate, however, does work well enough. It is ideal for folks who cannot take any THC-containing products, even near-zero levels. You have stumbled into a rolling conversation - between you, the reader, and me, the writer; between me, myself, & I; between folks who visit my shop, Ravenswood Natural Health. Why linger? As a clinical herbalist with 40+ years of self-directed research, plus a 2-year certification, plus ongoing education, I offer science based commentary on and practical suggestions to survive the chaos of the herbal world. I have no hidden agenda to sell brand x or promote the latest fad. You will find trusted links to studies both in the US & Europe on topics ranging from aromatherapy to CBD and anything in-between. Oftentimes a topic will suggest itself when multiple visitors ask the same question. Comment if you please. Ask a question. I'll do my best to answer. Clinical herbalist, shop owner, wild haired Saxon Celt. Coffee fuelled herbal wild woman. Nuff said.